It’s not so bad to be at the mercy of weather… sometimes a moon on a clear starry night, or a drizzly drippy shower can be quite inspiring. 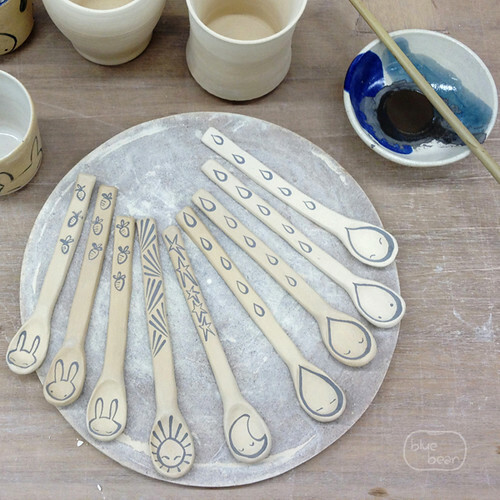 That’s how this handful of fun and expressive ceramic spoons came about — they’re a family of “weather spoons,” with a few bunnies thrown in for good measure. They have a more refined shape and are quite a bit larger compared to my previous test spoons. Their whimsical design is a spin-off of traditional “blue and white painting,” a technique used for centuries in China (see this blog post about qinghua painting). This photo was taken after the lines were painted, using the fine line brush, and before the “water pushing” (or filling) step, which is done with a “chicken head” brush. It’s interesting to note that the paint is dark grey in color at this stage. Each spoon was hand-formed from stoneware clay and allowed to dry before being hand-painted using the traditional Chinese cobalt pigment. I have used porcelain in the past, but decided to use a speckled stoneware clay this time around to pull it further away from its original qinghua roots. Usually my mind is too distracted or my hands are too dirty to take step-by-step photos in the studio, but I do remember to take a photo once in a while. That said, I have decided to share some of the photos in order to give a little glimpse into the process. 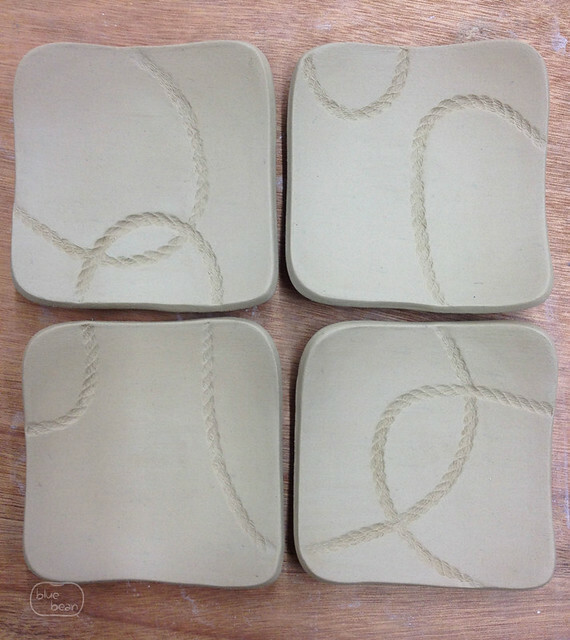 First off, here are the dark blue Rope Series Ring Dishes before they were fired for the first time. 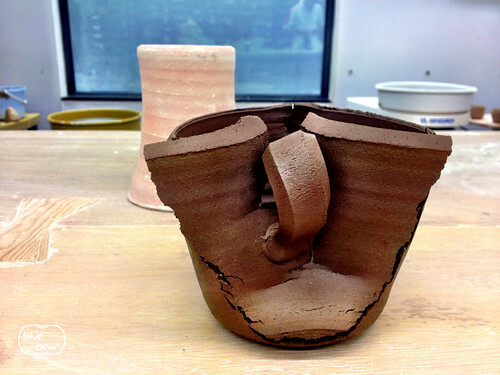 They began as soft slabs of clay that were then textured and shaped on a mold. The photo was taken just after the slabs were removed from the mold. They will be left to dry before being loaded into the kiln for the first firing. In general, the design aspect of this series happens as I am adding the decoration, so it is all quite organic. On a whim, I decided to make a set of interconnected pieces here. Each dish can sit on its own, but is part of a greater whole. The Rope Series is one of my favorite to make as I love to play with texture. It’s always a little odd to return to the studio after a long time away, especially traveling. The first day back always involves a little (or a lot of) dawdling… organizing thoughts and ideas, getting reacquainted with the feel of the work space and materials, being motivated to create. Usually it takes me a couple of days to really get back into the swing of things. But there’s nothing like a fast-approaching deadline to get you moving right away… and I had one of those to kick-start my week after a get-away-from-it-all holiday. A full wedding ceremony tea set (with back-ups) to be completed in an already fully scheduled ten days, you say? Challenge accepted! Plenty of people would be able to pull it off easily, but teapots are not my cup of tea (yes, I just did that). Still, I do like a good challenge, particularly when it involves creativity. 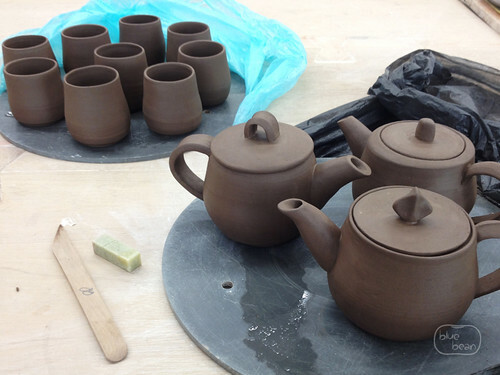 Here are some of the pieces just before they were decorated with slip (liquid clay). Anyway, the moment of truth comes tomorrow when the glaze kiln is opened. To be honest, I’m a bit nervous. Love it when something bad happens (a mug breaks) and something funny comes out of it (this clay face). Can you see his crooked nose, prominent chin, thick eyebrows and worried look? As frustrating as it is when something goes wrong in the studio, we should always be able to laugh at our mistakes! Remember my frustration with glazing last week? I had been playing around with new, fancy ideas which made my glazing process much more complicated than it needed to be. Well, I’m here to declare that it was all worth it! To be honest, there was a bit of anxiousness that I had managed to ruin all of my painstaking qinghua painting work with the experimentation. However, the pieces came out of the glaze firing looking much better than I expected. I am actually very happy with the results. All in all, I’m loving the qinghua pigment with dark blue or white glaze and I’ll definitely be playing with the combinations a lot more. The weather forecast shows rain over the next few days. 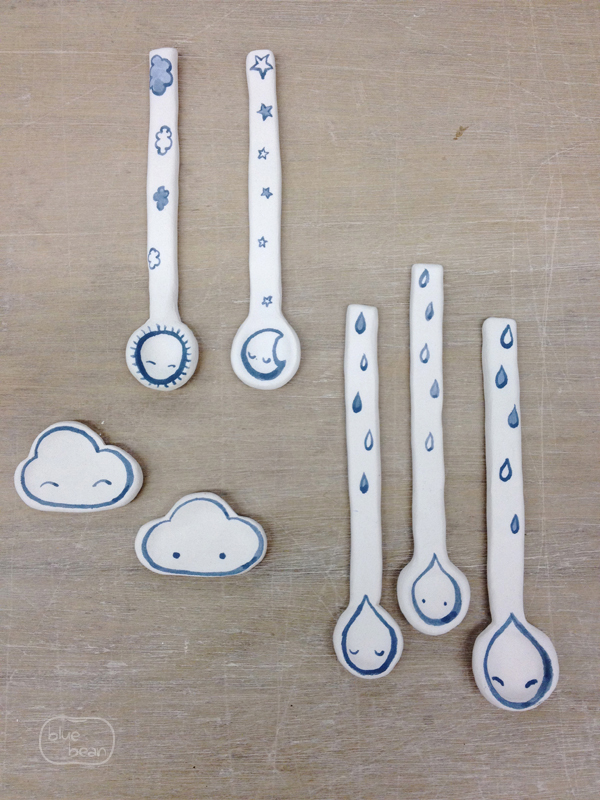 Rain outside means I’ll be staying inside the workshop to get some glazing done. Yay…? As I mentioned in my previous post, I have been inspired to do more qinghua (blue flower) painting on my pottery pieces since returning from my trip to Jingdezhen. 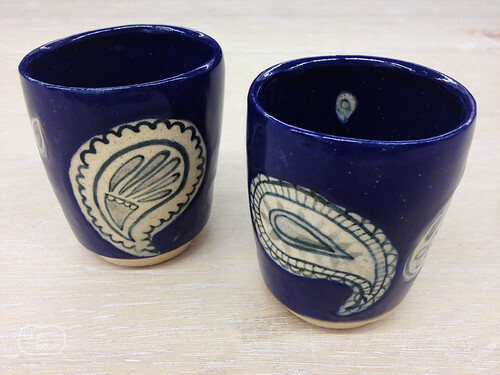 Since I had a few greenware cups, I spent some time practicing brush techniques on them — drawing lines, filling in areas. The painted pieces came out of bisque firing today and here are a couple of them, ready for glazing. 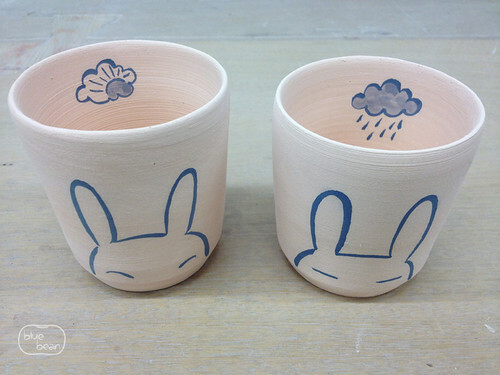 These cups have relatively simple bunny designs, but they perfectly represent my feelings today: the bunny on the left is before glazing, the bunny on the right is three hours later, after glazing. Glazing is such a time-consuming and often frustrating process… and I managed to make it even more so today with my fancy (crazy) glazing ideas. I really hope I didn’t completely ruin the pieces with my experimenting. Yes, as always, I’ll just have to wait and see. © 2014 blue bean studio. All Rights Reserved.